"Sunday Smiles is devoted to acknowledging the things that made me smile during the previous week. The beauty of this post is that it gives me the taste of the smile, yet again. If you play along, we can share our smiles with each other." Today I am playing along with Mis from Miel et Lait. She is a beautiful person and you should stop by her blog. After The Friday Flip-Offs I thought it would be good to share some of the sweet things that make me smile. Today I have much to smile about and it would appear that I have my blog to thank for the smiles this week. 1. I had a great review from Blog Brew Review on Monday. Thanks Liz. 2. I received 8 wonderful blog awards. The Trendy Blog Award from The Scoop on Poop and The Way I See Things. 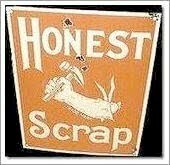 Honest Scrap Award from My Mommy Adventure and The Way I See Things. 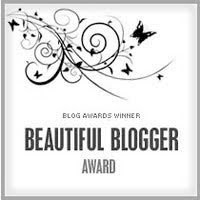 Beautiful Blogger Award from Honesty and Faith Rider Photography. 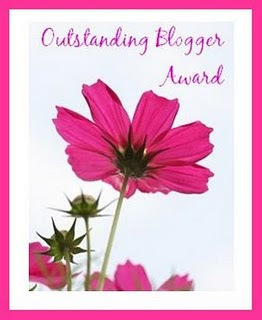 Outstanding Blogger Award from Life Sunnyside Down. Thank you so much for honoring me with such fine awards. They never cease to make me smile. I'm deeply touched. I've added them directly to the trophy case. Please make sure to drop by these blogs. They are my some of my favs. 3. I received a record number of link ups at my Wordless Wednesday party this week, over 150. I'm still trying to play catch up. But thanks! I had so much fun seeing so many great photos. One of the highlights of my week. 4. I hit over 300 on my GFC (google friend connect) this week. Thanks to Blisfully Insane for being my 300th follower. I never thought in my wildest dreams that I would have 300 people that would want to follow anything I had to say. Sorry, I have no prize. You caught me totally off guard. 5. I finally figured out how to contain all the buttons on my blog. Check out my new button page at the top. I'm a neat freak, what can I say? If you want me to add your button just leave me the link. Just an average chick from Iowa here. No giveaways or prizes yet, just me spewing my thoughts. Thanks so much for making me smile this week!! Congratulations on all the awards and the 300 followers!! You deserve it. I need to take inspiration from you and clean up my blog a little bit. Wow, 150 comments and 300 GFC followers! Awesome! Congrats on your awards and followers! What great "SMILES" you have! Whoo hoo on the awards!!! You write such a great blog you deserve them! Well--I think you're an amazing "average chick" from Iowa. Us Midwesterners need to stick together! And, congrats on the awards and the 300 followers. I love your blog. You're real, you speak your mind, and it always blesses me to come over here. Aww, Lish -- you are beautiful! Thanks for the mention! Mr. Linky wasn't playing nice with me this week. Next Sunday is another week of smiling to document. I have enjoyed reading your blog. Thank you for letting me visit. Congrats! I need to do the button-thingie, so many cool buttons to grab, but I don't know where to put them! Congrats on all of your awards...and on hitting 300! I'm 8 away from 300, and for some reason I'm nervous about hitting it...seems like that's a lot and I always think of that as a "big" blog in my head. Ridiculous I know, but there it is. I love the Sunday smiles idea and might have to try it next week. I'm so glad you decided to connect with me. Really like your blog. Cute ideas. Very fluffy. Congrats on being a connection powerhouse.